There have finally been a few days dry enough for me to put my smoker out in front of the garage and have at the smoking. I will try to smoke almost anything! On this sunny morning I stoked the smoker with alder chips and I smoked 4 lamb shanks (more about them in a later post), a small pork tenderloin which I ate on sandwiches, and two fat trout. I admit, I “caught” the trout in the grocery store, but they were mighty tasty nonetheless. The first evening I shared the smoked trout with a friend, on crackers with cream cheese. The next morning I had it on a bagel. I decided to use the rest of the trout to make smoked trout salad, which I planned to have on crackers. Then I came upon these adorable little corn chip cups, called scoopers. I originally bought them to use with fresh salsa – the baked cups only have 3 grams of fat for 14 cups. Be sure you get the baked ones, though. The regular scoopers have a lot more fat. 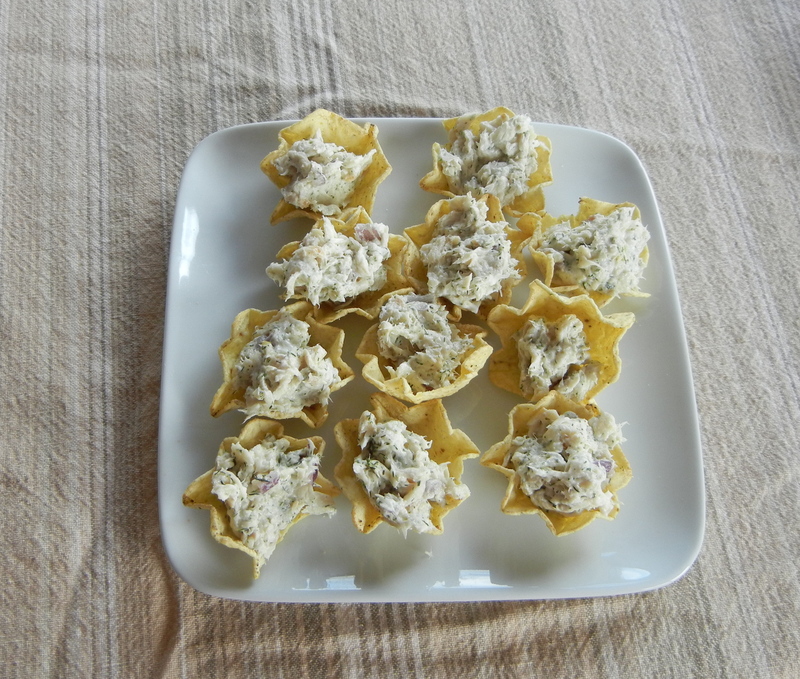 At any rate, I proceeded to make the trout salad and fill the little cups. What a nice, easy, impressive little appetizer. I am going to experiment with more fillings for these little cups. Mix trout, onion, dill, sour cream and salt thoroughly. Divide evenly among the scoops cups. Don’t fill the cups too far ahead of time; they get soggy. You might also decorate each cup with a sprig of parley, sliver of radish or another garnish. Makes 14 adorable and tasty smoked trout cups at just under 1 gram of fat/cup. There is a potluck today. It’s hot – in the 90’s, although today might be 2 degrees cooler. Too hot to bake something interesting. And you know everyone will be bringing salads and if they don’t feel creative, boxes of store-bought baked goods. And did I mention it’s hot? I am not fond of hot weather. I like clouds. Then, to my rescue, the local grocery had whole trout on sale. Chubby, sleek trout with their heads on. I bought six of them. I had the butcher remove their heads (“I’m decapitating” he said. “Tell the other trout not to look”). I took off tails and fins at home and smoked the whole trout in my handy smoker. I didn’t do anything special to them – no seasoning or brine. I smoked them over alder chips for 2½ hours. Trout are actually rather fatty, so they grill and smoke well without getting dried out. They have a distinctive flavor, too, that I didn’t want to mask. I think next to steelhead, trout are my favorite fish. Once the trout were done, I skinned them and took as many of the bones out as possible. I find this easier to do once the fish is cooked, since the skin peels right off and the bones more or less lift out when you pull the spine out. Then I wrapped them individually and put them in the refrigerator to chill. This morning, I made a big platter of smoked trout – three of the fish (the rest I’ll use for other things) atop fresh leaf lettuce, with thinly sliced sweet onion, ripe tomatoes, and cucumber, with lemons scattered about for those who want them. Now this has the requisite Wow Factor to take to a potluck. It actually looks more involved than it was to make (Remember, it’s hot). It’s all in the presentation, sort of like accessorizing a basic dress. This also follows my Principle of never making anything for a potluck that you don’t want to eat as leftovers. To accompany the trout platter, I thought that most people would want to put their bit of trout on bread or crackers. I bought some interesting dark bread and also cut up a baguette, toasting the slices to crisp them up. I made two spreads to go with the trout. One was cream cheese and chives – put chives in the food processor to chop, then add an 8 ounce bar of low fat or non-fat cream cheese. The second spread was a little more unconventional – blue cheese and sun dried tomatoes. Place the sun dried tomatoes in a food processor and pulse several times to chop. Add the remaining ingredients and process until fully blended. Refrigerate overnight to blend flavors. This has about 1 gram of fat/2 tablespoon serving. I have been traveling a lot for a month or two and not having much chance to cook – although I’ve discovered some outrageous restaurants. I love to eat in good restaurants, but I miss my own cooking.. My kitchen has been bereft of fresh fruits and vegetables in order to avoid having them rot while I was on the road (or in the air). But now I’m back, and the farmers’ markets and grocery stores are packed with summer fruits and vegetables – the grill has been more or less cleaned – so let the cooking begin! Tonight I grilled trout. The grocery had them whole, heads and all, but I asked the butcher to chop of the heads and tails and split them open so they would lay flat on the grill. They were too small to bone prior to cooking, but once they were grilled, the bones more or less lifted right out. I decided not to fuss with the trout, since they were fresh and would have their own delicate flavor. Trout Is often sautéed or pan fried, but freshwater trout has a high fat content and can easily stand up to grilling. I made a lightly spicy fruit salsa with and Asian touch to go with the fish. Preheat the grill, then reduce the heat to medium low. Cut the red pepper in half and remove the seeds and veins. Place cut side down on hard surface and flatten with the palm of your hand. Spray both sides of the pepper with cooking spray. Place on grill, cut side down. Grill for about five minutes per side, turning once. (I used a barbecue grill pan sprayed with cooking spray on top of the regular grill to make it easier to remove the pepper without sticking). Remove pepper and allow to cool slightly. Cut the pepper into ½ inch dice. Mix the pepper, mangoes, onion, cilantro, chili, and sweet chili sauce in a medium bowl and set aside. Spray the trout with cooking spray and sprinkle lightly with mesquite seasoning. Place flesh side down on the same grill surface you cooked the peppers on. Cook for 5 minutes, turn over, and cook for about 4 minutes more. Serve with salsa. This makes 4 servings. The amount of fat depends in part on the type of trout – rainbow trout have more fat than lake trout, but I estimate that the total fat is about 8 grams/serving. NOTE on peppers: I had a bag of red bell peppers, and took the opportunity to grill all 5 of them so that I could use them for sandwiches and such. No sense turning on the big barbecue and grilling one every time I need one, when they keep quite well for several days refrigerated in a sealed plastic bag. This is a bit of a accidental dinner. About a month ago, I went out to dinner with a friend. The restaurant was having “halibut month,” with this firm fish cooked in several interesting preparations. My friend had halibut with huckleberry sauce; I chose the halibut baked in sour cream. It was fantastic. Somehow the sour cream coating kept the fish moist and tender. I’ve had some pretty reprehensible halibut – overcooked and dry, but this was delicious. I planned to call the restaurant and ask for the recipe so I could make a reduced fat version, but I just didn’t have time. I did, however, have halibut. Tonight I decided to improvise – it wasn’t quite like the restaurant’s version, but it was still great and easy to make. Preheat oven to 350 degrees. Spray an oven-proof casserole with cooking spray. Slice the tomatoes and place in the bottom of the casserole dish. Sprinkle with onion powder. Place halibut on top of tomatoes. Sprinkle with onion powder. Spoon sour cream over halibut. 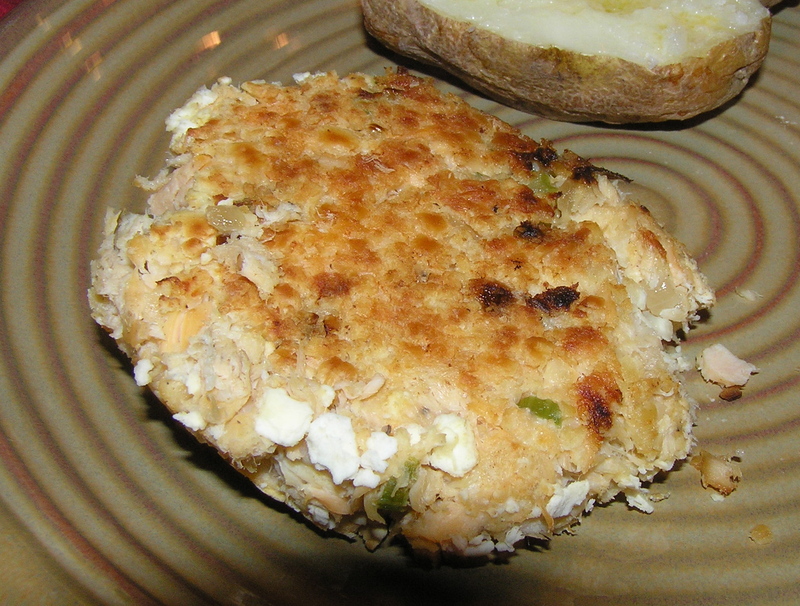 Bake for 30-35 minutes or until halibut is fully cooked. Lift halibut out of the casserole onto a plat and spoon tomatoes and sour cream over the fish. Makes 2 servings at about 3 grams of fat/serving. When I was young, my mother used to very occasionally make “salmon croquettes”. They seemed very exotic to us with our usual hearty but plain diet. Perhaps it was the name, so…French. Actually, the name does come from the French croquer to eat hastily. According to Wikepedia, a croquette is a small fried roll containing mashed potatoes, minced meat, shellfish or vegetables, often encased in breadcrumbs. The croquette is usually shaped into a cylinder or disk, and then deep-fried. There are variations of croquettes in almost every culture. My mother’s salmon croquettes did not contain mashed potatoes. These taste very much like hers did, although I’m quite sure hers were fried in a lot of oil. Spray a small frying pan with cooking spray. Sauté the celery and onions over medium heat until soft, adding a small amount of water periodically to “steam fry” or sweat the onions and celery (see HINT). In a medium bowl, combine onion mixture, ½ cup of the crushed crackers, mustard, black pepper, salmon, and egg substitute. Divide salmon mixture into 4 equal portions (if your mixture is too crumbly to shape, add a little more egg substitute.) Shape each portion into a ½ inch thick patty. Put remaining crushed crackers into a flat bowl or plate, and dredge each side of the patties in the crumbs. Place on a plate, cover, and chill for 20 minutes (this helps the patties hold their shape). Spray a large non-stick frying pan with cooking spray. Add the 2 teaspoons of oil, and heat over medium heat until hot. Add patties. Cook for 5 minutes on each side, or until lightly browned. NOTE: I used Costco canned salmon, which is skinless and boneless, and has only 7.5 grams of fat in the 7 ounce can, keeping the fat gram count low. HINT: “sweating”, or steam frying, is a means of cooking vegetables for inclusion in other dishes while eliminating the fat typically used to sauté these vegetables . The vegetables are heated over medium high heat until they begin to brown lightly. Then small amounts of hot water are added and allowed to cook away until the vegetables become soft and golden. This is one of the most effective ways of lowering fat in a dish, particularly if the oil is not essential to the flavor of the finished dish, but just a medium for cooking the vegetables. You can serve these with low fat tartar sauce, or make a tangy sauce with reduced fat mayonnaise, capers, and lemon juice. Variation: These are very plain salmon patties, like my mom used to make, which is the comfort food I was in the mood for. But I can see jazzing them up with chopped capers, or chopped roasted red peppers, or even a spoon full of pickle relish.